JOHANNESBURG, South Africa, July 8, 2011 (ENS) – Tree planting and park restorations are among the activities planned by Joburg City Parks in observance of Nelson Mandela Day on July 18. The day is marked each year to honor former South African President Nelson Mandela on his birthday. Mandela was born on July 18, 1918; this year he turns 93. Festivities begin Saturday as a host of motorcyclists, actors, musicians and businessmen take off on an eight-day, four-province bike tour to encourage environmental and community actions that reflect Mandela’s own dedication. Held prisoner for 27 years for his fight against apartheid, Mandela was president of South Africa from 1994 to 1999, the first South African president to be elected in a fully representative democratic election. Nelson Mandela Day is a day of public service where people are encouraged to spend at least 67 minutes doing some form of community service in honor of the 67 years that Mandela spent fighting for social justice and human rights. Joburg City Parks Managing Director Geoffrey Cooke urged businesses and residents to celebrate the contribution made by Mandela by pledging 67 minutes of their time to resolving environmental imbalances while simultaneously increasing the quality of life of fellow citizens. 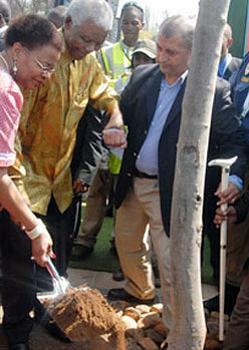 Businesses will be planting donated trees together with their employees at the various sites. “Employees from City Parks will be involved in upgrading the lawns and recreational facilities at the Orlando Children’s Home in Soweto,” said City Parks’ spokesperson Jenny Moodley. Endorsements and comments on Nelson Mandela Day can be posted on Twitter or Facebook or emailed to jcp@jhbcityparks.com. “Businesses and celebrities are also encouraged to endorse their support on Twitter and Facebook by indicating where they will be,” said Moodley. International organizations affiliated to the Federation of Parks and Recreation and the Institute for Environmental and Recreational Management will also mark Nelson Mandela Day by contributing 67 minutes to green the environment in their own countries. Setting off from Montecasino in northern Johannesburg on July 11, the Bikers For Mandelas will visit villages and cities in Gauteng, Free State, KwaZulu-Natal and Mpumalanga. The bikers will arrive back in Gauteng, in Tshwane, a week later, on Nelson Mandela Day. This year’s route covers heritage sites that are significant in Mandela’s life and times, including the place near the KwaZulu-Natal town of Howick where he was arrested on August 5, 1962. This year marks 49 years since that arrest. A section of the route will cross the border to traverse neighboring Swaziland. Bikers For Mandela will visit community projects along the route, devoting 67 minutes of their time at each one to activities that will leave a lasting and sustainable impact on their beneficiaries. “The Bikers For Mandela Day trip this year is more arduous and extensive than last year’s, which is saying something considering we encountered rain, storms, sunshine and even snow en route in 2010,” said Zelda la Grange of the Nelson Mandela Foundation, who participated in last year’s tour. “Significantly, both the day of departure on 11 July and the day of return by Bikers For Mandela Day are Mondays, further reinforcing the recently launched Mandela Mondays of the Nelson Mandela Foundation,” the foundation said in a statement on its website. Launched on June 1, Mandela Mondays encourage everyone to donate a few moments of time each Monday to do something “to benefit their fellow human beings, the community or the environment in which they live,” the foundation explains. 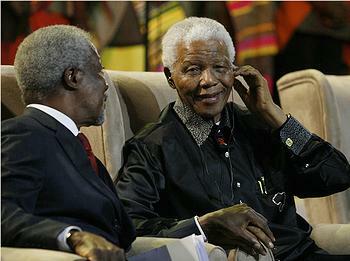 In a video message on the official Nelson Mandela Day website, Mandela said in 2010, “We have been pleased and honoured by the way Mandela Day has been responded to. People have made it an occasion not to focus on one man but rather to work with each other in communities to make the world a better place. The Director of the Library of Alexandria, Dr. Ismail Serageldin, who witnessed the beginning of the uprisings in North Africa and the Middle East, will deliver this year’s Nelson Mandela Annual Lecture on July 23 in Johannesburg. The lecture will focus on Pluralism, Cohesion and Social Participation for a Just Society. Dr. Serageldin is Professor of the International Chair Savoirs contre pauvrete (Knowledge Against Poverty), at College de France, Paris. Author of over 60 books and monographs and over 200 papers, Dr. Serageldin has served in a number of capacities at the World Bank, including as vice president for environmentally and socially sustainable development.